We received a selection of great toys for kids to facilitate this HABA review. All opinions are our own. The HABA company was founded in Germany in 1938 as a factory for polished wooden toys. Today this company has expanded their mission to provide not only heirloom-quality wooden toys for kids, but an array of infant teethers, pretend play, room décor, blocks, dolls, arts and crafts, and even innovative kitchen items. On their website www.habausa.com, I was able to see an extensive list of awards HABA has earned from non-profit and special interest groups as well as reputable organizations. If you’re a parent who likes to have an idea of what goes into products you buy your children, you can find a tab that breaks down the materials used in each HABA product and which material safety guidelines they satisfy. When it comes quality toys for kids that are attractively designed and fun to play with, HABA seems to take note of the tiniest details. When my daughter had the opportunity to get her hands on several of their pretend food items, she didn’t know what to reach for first. 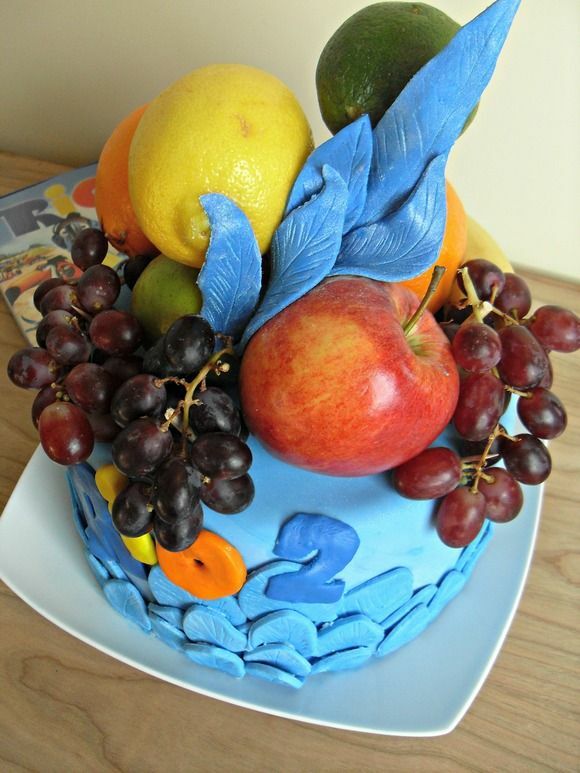 First up, she was going to bake an apple pie. 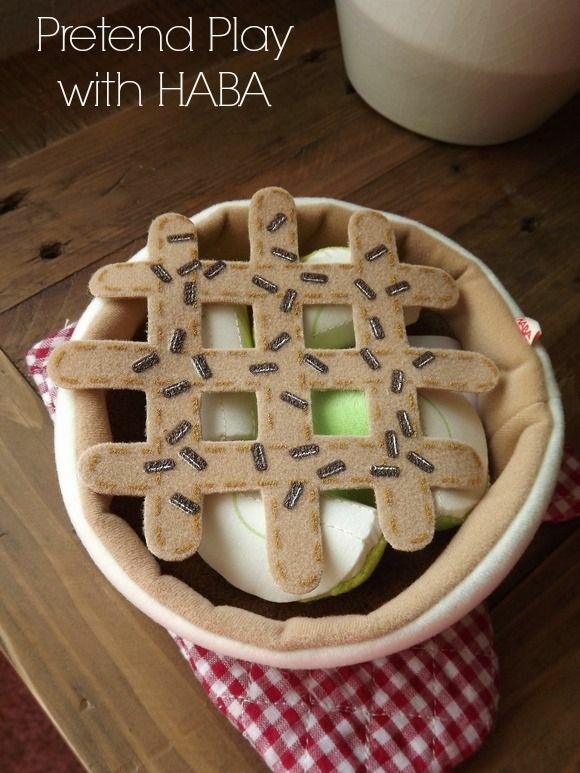 The soft, plush Biofino Apple Pie is 6.5” in diameter and made of cotton and polyester. It includes the pie crust base, 5 apple slices, and a piece of lattice dough that can be set on the top of the pie in either of two ways. My daughter had a great time at her kitchen pretending to wash and cut the apple pieces before placing them in her pie and adding the lattice top. I watched her pop the pie in her pretend oven like she was THE greatest little pastry chef. 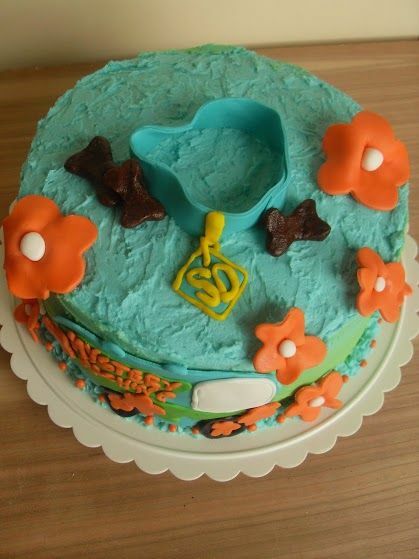 Children love play cooking and this proved to be a great product for doing just that. 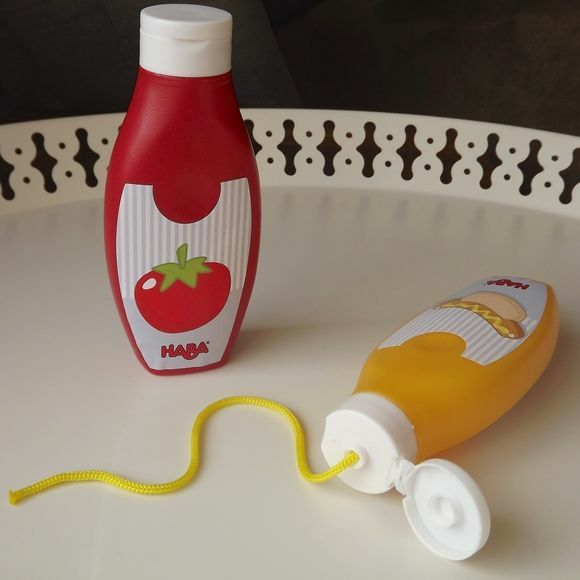 Next up were the HABA Mustard and Ketchup bottles. These bottles were a hoot! Made of plastic and standing at about 4.5” tall, these two bottles are appropriately colored and labeled with their coordinating condiment. The thing that makes them especially fun for little chefs is the string inside each one that pops out when you squeeze them. What a simple yet clever concept. My daughter was squeezing ketchup and mustard on pretty much any food item she could find. Each time letting out a little giggle. When she needed to stuff the string back into the bottles I needed to assist her a little, but otherwise these mustard and ketchup bottles were a hit and she really enjoyed them. Hotdog anyone? Now of course your little chef is going to eventually need a little salt and pepper. The HABA Salt and Pepper Grinders stand about 7.5” tall, and are made of cotton and polyester. 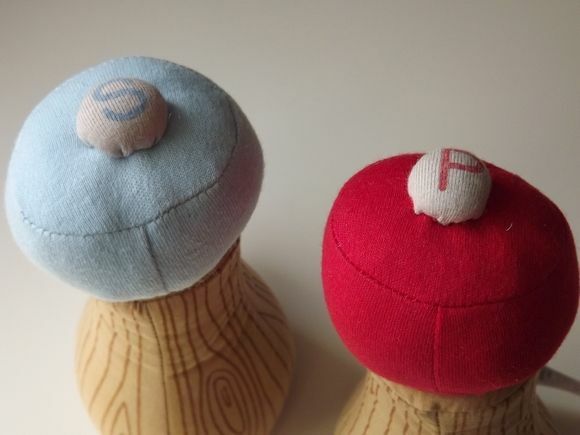 The set has a faux wood pattern on the fabric, and even makes a clicking sound when you rotate the tops. Just like the Mustard and Ketchup set and their squirtable string, the click and rotating movement HABA has added to this set really appealed to my daughter. Once again, salt and pepper on everything she could spot. 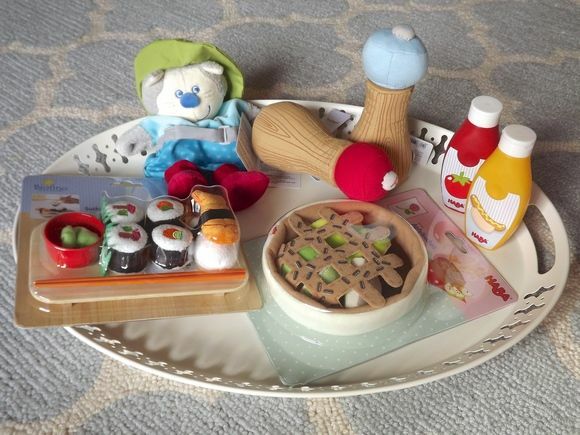 Last but not least, was the adorable HABA Sushi Set toys for kids. My daughter baked her All-American apple pie and then moved on to a traditional Japanese favorite:sushi! This set includes 4 rolls, 1 salmon sushi, a small cup with a piece of wasabi, and a decorative piece of leaf grass for decoration. 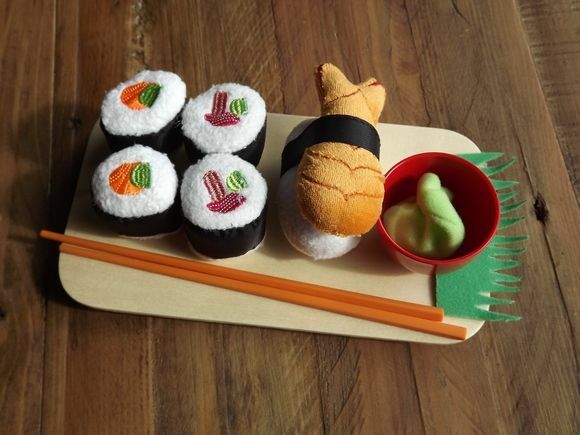 Your little one can set it on their wooden board and pretend to enjoy their sushi with their own set of included chopsticks. 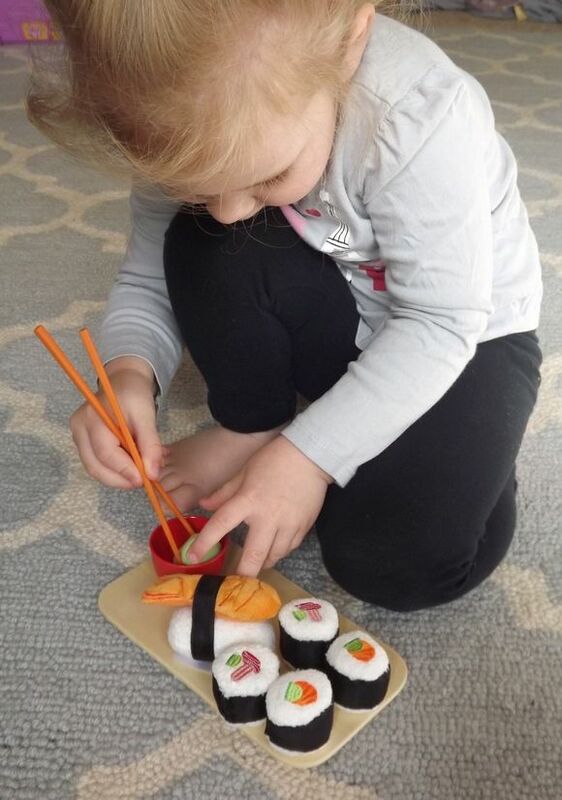 The pieces are so life-like my daughter immediately made the connection to the real-life sushi she sees my husband and I enjoy on occasion. 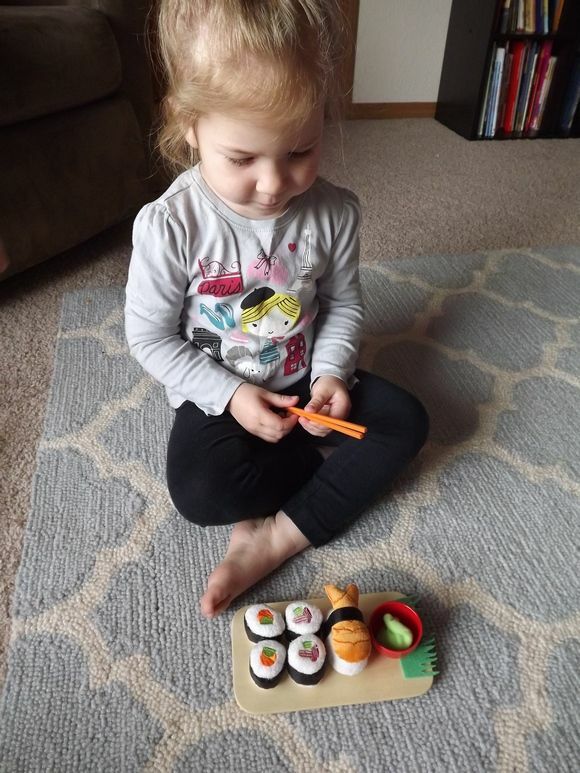 While she hasn’t been brave enough to try the real thing, I watched her try her best to use the chopsticks and pretend to eat her rolls and sushi like she was pretty special. 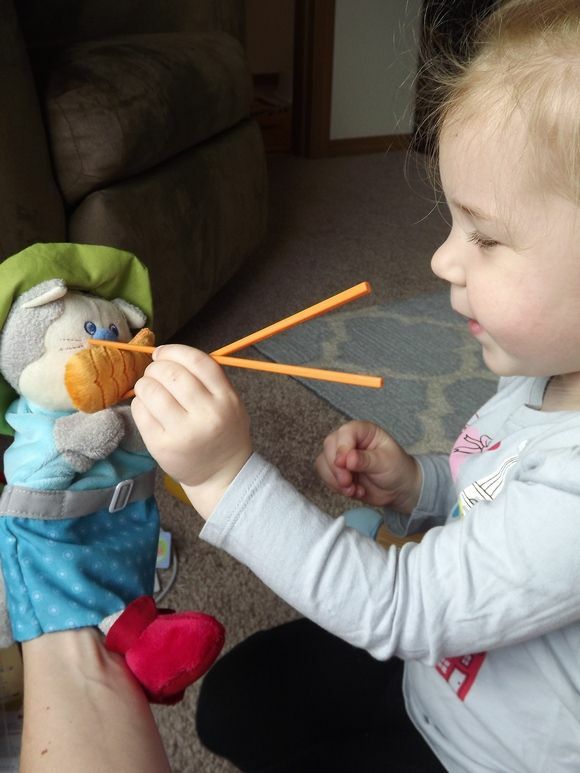 In addition to this, using chopsticks to pick up anything is a great way for kids to improve their hand-eye coordination and fine motor skills. 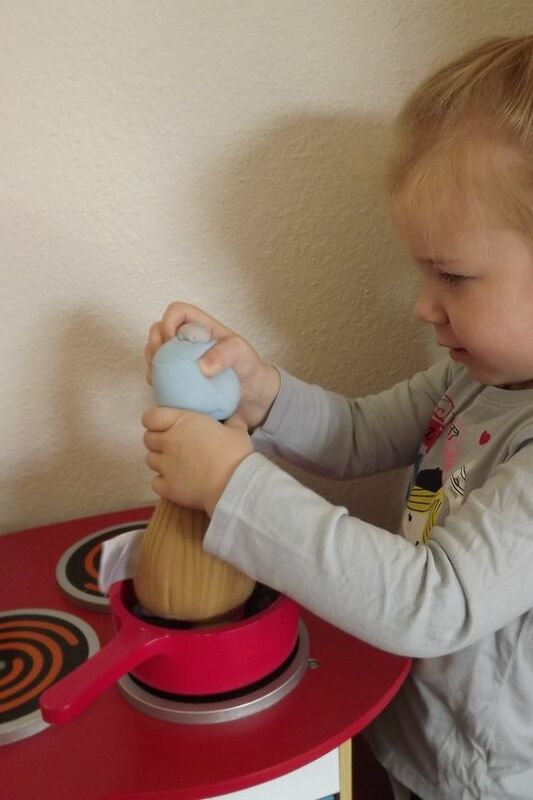 Being able to work on those skills through play is an added bonus when it comes to any toy. As I mentioned back in the beginning of my review, HABA manufactures a wide array of products, as my daughter and I also got to see with the Puss in Boots Glove Puppet. 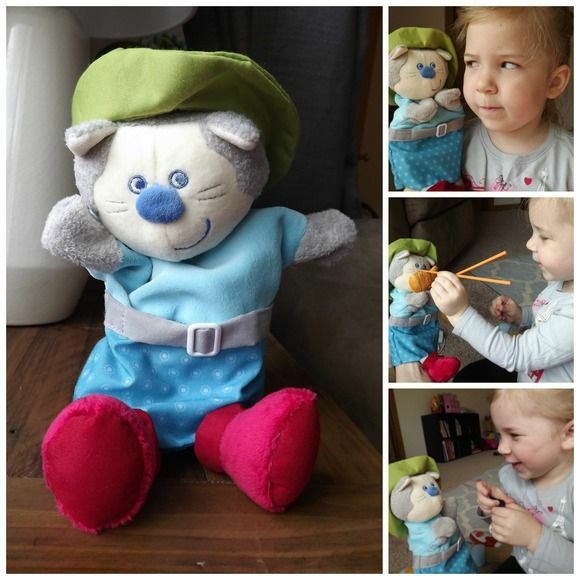 This puppet is just as soft as the other HABA products, and my little one got a kick out of me animating it and had lots of fun attempting to do so herself. She liked interacting with this cute little guy so much she wanted to make sure he got a piece of her sushi. Cats love fish, right? 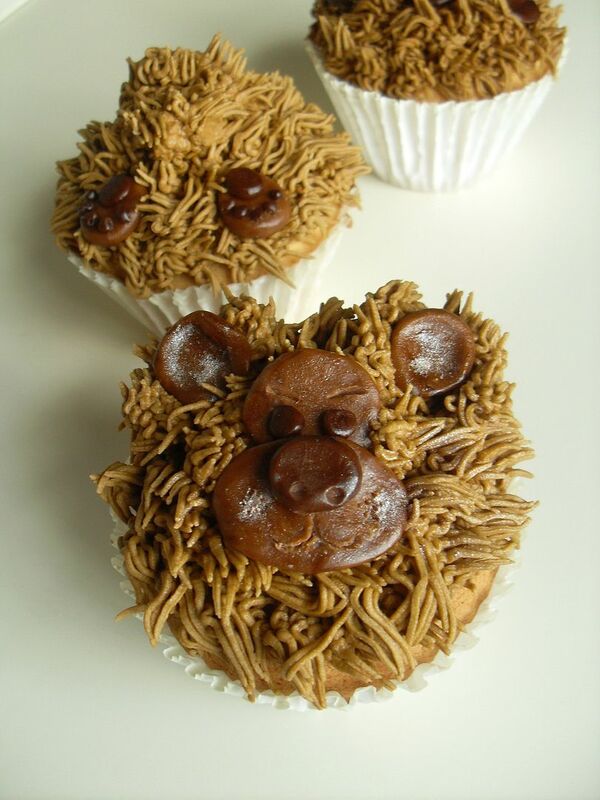 Pretend play is not only fun and entertaining, but also fundamental in the growth and development of young children. Each of these HABA products offered their own unique design detail that made them fun and enjoyable to use. They appeared to be made well with quality materials and I can see them standing the test of time. For more information on these products and more, explore the HABA website at www.habausa.com. Once there, you can also place a purchase or find HABA retailers. The Bionfino Apple Pie currently retails for $12.82, the Mustard and Ketchup Bottles retail for $6.95, the Salt and Pepper Grinders retail for $18.95, the Sushi Set retails for $16.14, and the Puss in Boots Glove Puppet retails for $15.19. Don’t forget to check this Organic Toy Haba Review on our sister site: Haba Pure Leafy Doll Review. Enter below for a chance to win a selection of HABA toys for kids that we reviewed! Giveaway is open to US residents age 18+ and ends on June 5th. I love Haba toys! 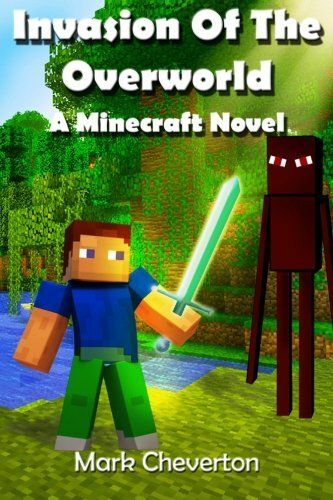 I’d like the first blocks set. They’re so colorful and can be used by many ages. I love the Doorway Theater. I like the Aquini Girl Gotz Doll. Oh the Expedition Dino looks so fun!